InfoComm 2015 will mark the U.S. debut of the new, patented Meyer Sound LEOPARD line array loudspeaker and its accompanying 900-LFC low-frequency control element. The smallest and most versatile members of the flagship LEO Family, the new system will be demonstrated live during the show, along with a range of other high-performance loudspeakers for installations and touring. 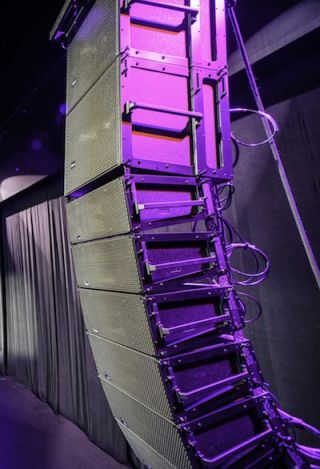 The Meyer Sound LEOPARD line array.Boasting tremendous power-to-size ratio with ultra-low distortion, LEOPARD and the 900-LFC element offer an unprecedented level of clarity, power, precision, and ease of use. To hear the full power and capability of the LEOPARD system, visit the Valencia Ballroom during the show to attend the public listening sessions on Wednesday and Thursday at 3:00 p.m., 4:00 p.m., and 5:00 p.m. Friday demos will take place at 3:00 p.m. and 4:00 p.m.
Visit the Meyer Sound demo room 203A to hear installation products including the AVnu-certified CAL column array loudspeaker, as installed in the Carolina Panthers’ Stadium and Amsterdam’s renowned Concertgebouw. Also demonstrated are the company’s remotely powered installation loudspeakers featuring IntelligentDC technology and the MJF-210 stage monitor. In addition, a small setup of the LEOPARD system will be on hand for a teaser demo. The demo room schedule will begin Tuesday at noon through end of show Friday every two hours, at even hours. At the Meyer Sound booth 1243, the growing LEO Family will be shown, including the LEO-M and LYON line array loudspeakers. Visitors will also learn about the new MAPP XT system design tool and the new Compass Go By Meyer Sound iPad app for optimizing Meyer Sound systems. As part of the InfoComm University education program, Buford Jones, live audio and education specialist for Meyer Sound, will lead two sessions on Wednesday, June 17: “Principles of Live Mixing” at 8:00 a.m. and “Mix It Up—Live Audio Workshop” at 12:30 p.m.